Information for the novice and expert alike. To the many devoted people who entertain themselves with the possibility of visiting prime fly fishing destinations in the continental US Yellowstone Park is the hands down, first row, first pew, undisputed leader of all US locations. I feel very fortunate to live, instruct and fish in such a close proximity to this National treasure. In fact, during the fishing season, which annually starts on June 1st and continues until November 1st visiting anglers visit my shop before venturing out to fish various waterways in the Park. Once there the angler can collect photos of prize fish, scenery and wildlife which will adorn walls and desktops for a lifetime. So as I sit here at my desk, I wonder where the best point is to start such a monumental task as describing the benefits of visiting our nation's first National Park. A brief physical description may be in order. Located in the northwest corner of Wyoming and bordering the states of Montana and Idaho, Yellowstone National Park is easily served by three major airports; Billing and Bozeman, Montana as well as Jackson, Wyoming. Car rentals are plentiful and contrary to some beliefs, most of the roads are paved, patrolled and well traveled. Therefore, the Park retains an easy access for the first time visitor. Here, in the natural wilds of the Park, the visitor can quickly see wide panoramic vistas which western artists are quick to put to canvas. Many animal naturalists, seen carrying their large telescopic lenses, come to the Park to view and photograph the abundant wildlife which usually includes buffalo, elk, coyote, bear and the newly reintroduced wolves. Birdwatchers and wildflower lovers spend countless days visiting the wide variety of habitats which create diversity to their particular pursuits. And, here is where fly fishers, from all over the USA, dream of coming on those snowy, suburban winter days or when life in the downtown office becomes just a bit too much. Yellowstone, is the beating heart of fly fishing in America. Regardless what your passion may be Yellowstone National Park is truly a vacation spot well suited for everyone. The first question asked by many anglers, who are coming to Yellowstone for the first time is simply, "where would be the best place to fish in the Park?" Geographically the northern and western sections of the Park generally have the best access to creeks and rivers. And, unsurprisingly the waters that pour out of the Park from these locations provide the angler with miles upon miles of more water to wade and float. So lets take a look at what these waters have to offer the fly fisher. 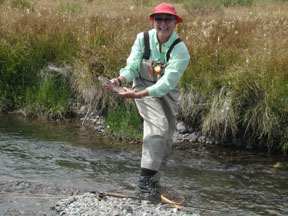 For the beginning fly fisher waterways such as Lava, Indian and Tower Creeks as well as the Gardner, Gibbon and the upper Firehole Rivers provide the novice angler with numerous opportunities to practice the skill of casting, drifting a fly naturally before a fish and ultimately hooking a trout. In these waterways the fish are numerous and it is quite easy, even for a beginner, to catch 25 to 50 six to ten inch brightly colored fish in an outing. All of these fish, after a long winter under the ice and snow, are very cooperative when a fly is presented. A good point to mention is that along these waterways access into these streams is easy even for the most hesitant beginner. The grassy banks rarely provide a convenient tree to hang a fly on. 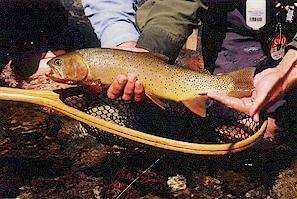 Overall the initial experience of fishing on these picturesque trout streams will be an opportunity of a lifetime and for the more accomplished angler, who is indoctrinating a novice into this hobby, the results are outstanding. Here, an angler may create a fishing partner that will quickly follow to other suggested points on the compass. It's a win-win situation for everyone. 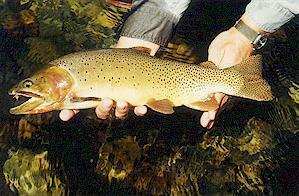 Moving into intermediate fly fishing waters names such as the Madison, Yellowstone and the Lamar Rivers hold numerous opportunities for unfurling long reaching casts as well as the chance to present numerous and different fly patterns. However, since these are Western rivers the flies the angler will use will be bigger then other trout waters. This in itself is fun when the angler can easily see a freely floating fly course through probable feeding zones of trout. Exciting hits will follow a well-presented fly and the fish, besides being native and larger in size, will provide the fly fishers with hours of entertainment all while fishing very close to where you first started. Then there are the waters which present different scenarios on a daily basis. These creeks such as Slough, Soda Butte, the lower Firehole river will test even the most accomplished angler especially as the season moves along into late summer. Here the fish have been caught and released one or more times and, as late summer anglers begin to trade locations by fishing a morning here and the afternoon there, the fish become very wise to what the angler may present or even become fully aware as to the different techniques which may be utilized by the better fly fishers who wade these honored waters every summer day. As far as the gear which may be needed on a visit to the Park, this varies as to personal needs or preference. Many anglers use a feather light 7'6" 5 weight graphite rod which handles nearly every daily situation which is encountered while fishing in the Park. However for the beginning students are normally outfitted with a 9 foot 5 weight rod. This added length of rod helps the novice reach more distant areas. 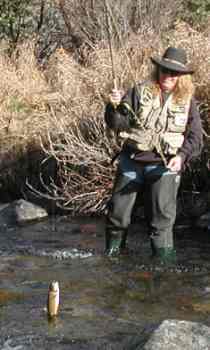 Felt soled waders will be an essential item as the angler crosses creeks on moss covered freestones which line these waterways as will several handy tools, which are conveniently hung from a fishing vest. Polarized sunglasses will make seeing through any glare on the water easier especially if they are worn under a wide or long brimmed hat. All of these small items can make an extreme difference in comfort as well as ultimate success. The Park is encircled by fly fishing support personnel which can lead you in the right direction and satisfy your specific needs whether it be lessons, guiding or equipment and supplies. Accommodations come in a wide variety of pricing as well as luxury so be certain to ask whatever convenience it is you may be seeking on your western get away. At Lake, the oldest Park lodging facility, a vacation spent nightly in a stately room overlooking Yellowstone Lake and accompanied by elegant dining can be found to be a delightful cap to a day spent outdoors. Or fifty miles away the newly constructed Snow Lodge at Old Faithful creates an opportunity for experiencing the marvels associated with geysers and all they can display. The Old Faithful Inn is an experience and an institution unto itself. Its visitors all stare at the grandeur of the vaulted, log created majesty of the lobby. The Mammoth Hot Springs Hotel offers the Park visitor sumptuous dining and for the more adventuresome Roosevelt and Canyon Lodges each have their own character and charm although the cabins are a bit more rustic. In the Park you will want to contact Xanterra Resorts at (303) 297 -2757 or by going to http://www.xanterra.com for accommodations held within the Park itself. For others, seeking more of a true western experience, can hire an Park licensed outfitter who can saddle the angler to a gentle mountain trail horse and deliver the string of riders and pack horses deep into the interior reaches of the Park. There, out of sight from man made objects and surrounded by the solitude of the pristine mountains and their streams the outfitted angler can catch fish in crystal clear water until the arms ache and at night everyone will watch the bright stars rotate through the sky as meteorites streak across the heavens. Adjacent communities such as Cody and Jackson, Wyoming may be a bit too far for a commute into the Park on a daily basis but West Yellowstone and Gardiner, Montana offer the Park's visitors the opportunity to step out of the Park and quickly be back in the civilization that can offer four star dining and shop till you drop experiences. Art galleries, white water rafting and day trips on horseback can easily fill the time spent in "Yellowstone Country." Just north of the North entrance to the Park lies the nearby Paradise Valley. It is rural in its nature but does host many B&B's and cabins which will all be, in Montana terms, near activities and facilities which the angler can make use of. I am proud to call this valley and all of its splendor my home. The local web site http://www.ynp-lodging.com which acts as our local area's business guide is great for all accommodations within the Paradise Valley.